Angela studied for four years at the Bournemouth and Poole College of Art and Design under the tutelage of Dorset painters Brian Graham and Peter Joyce. She started painting in water colour about twenty years ago and then moved on to oils. She now paints in the mixed media of acrylic and charcoal and oils on canvas. She has exhibited and sold her work at the Seldown Gallery in Poole, the Atrium Gallery at Bournemouth University, the Maltby Gallery in Winchester, the Red House Museum in Christchurch, the Town Mill in Lyme Regis and The Gallery in Dorchester. 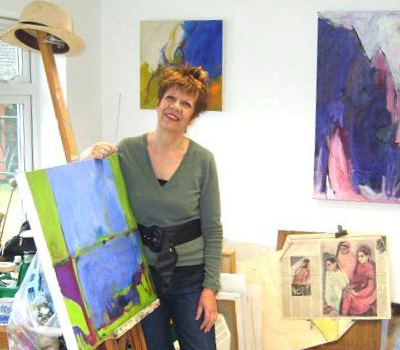 She had her first ‘solo’ at Bettles Gallery in Ringwood and exhibited at the Beatrice Royal Gallery Eastleigh, where she also had a solo exhibition and they exhibited her work at the Affordable Art Fair at Battersea. She has work in numerous private collections. Angela uses quick pencil sketches as the basis for her paintings and prefers working on several pictures at the same time. She has lived in Dorset all her life and finds the Dorset landscape and her own garden a constant source of inspiration for her work. She recently moved from Holt to Colehill near Wimborne where she is recreating a new garden. Angela has worked on murals in local schools such as West Moors Middle school, Elmrise at Kinson and St Johns at Moordown. She draws the mural by hand in charcoal directly on to the walls and they are then painted in and finished off in acrylic. Many other paintings can be viewed at Angela’s new studio in Colehill by appointment only. Prices from £100 according to size.